The word ‘engagement’ is thrown around a lot on social media that only a few brands know about it actually. Brands might pursue all the marketing gimmicks but see little engagement. It is easier to use a social media platform to put up your content but not easy to produce engagement. If you start considering it as an avenue to truly engage customers, you can succeed in generating leads, brand awareness or customer support. Engagement Rate is the measure to track the value of your marketing efforts. So, what exactly does Social Media Engagement mean? These actions show how much your followers are active and follow your content online. They measure the effectiveness of your marketing campaign and generate leads for you. Social media is about being social and being a two-way interaction. Brand Nike has a separate Twitter account ‘Team Nike’ dedicated to customer engagement. Followers want to talk to the real person behind the account and engage one-on-one to solve their problems and this makes a difference to the faith they have in your brand. Build brand awareness as Casper does here. You must be thinking, is there really a need to plan a strategy for engagement. The answer is affirmative and is beneficial to grow your business if done the right way. Let’s look at some of the ideas that will help you to strategize effectively. What you want to achieve from your social media strategy depends on your business. You should set a goal which clearly outlines how to use engagement on social media that can impact the business positively. Guiding customers in their buying journey. Improving Brand Perception and Recognition. 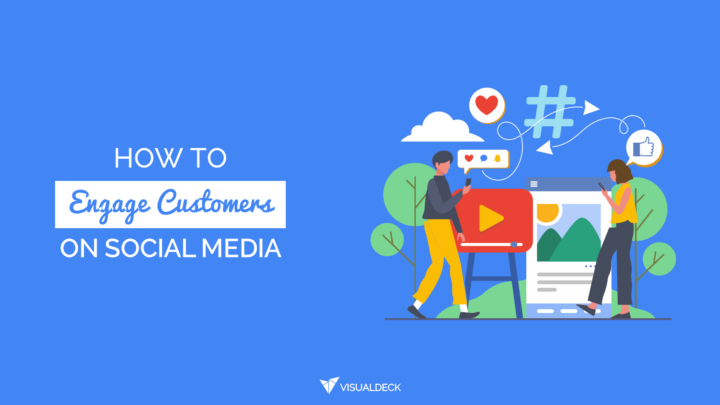 Know your customer first, then make your social postings and strategies. Learn your customer wants and desires and listen to their struggles, you will open doors to directly address them on social media and engage your audience. After discovering the kind of content your audience is looking for, it’s time for action. For example, you might be wondering why a clothing brand Wholesome Culture is posting healthy recipes and food images on Instagram. The brand’s audience consists of people on plant-based diets. Therefore, they are creating the content that the audience wants to see and using popular hashtags to get discovered by the target audience. This will attract new customers, help current followers and boost engagement. Interactive and visual Content can help to connect with the audience. Post Questions that invites people to share their opinion on something. Create Poll on Twitter and Facebook and learn meaningful things about your customer and engage them. Q & A round with your audience on Instagram, Quora, LinkedIn or Twitter. You can also post on blogs, online group or community. Ask relevant, interesting and timely questions which can create an engaging and interactive social media activity for all. Personality or General quizzes are also quite intriguing to engage the audience. Would you party like it’s 1899 or let the music take you back in time? Encourage your audience, partners, and employees to advocate for your brand and create content featuring your brand. Use Hashtags (#): They are a click-to-connect ticket with like-minded people. Using relevant and unique phrase reflects your brand in the search results of the target audience. Invite your followers to hit #key and hashtag content related. Contests: There are many contests on Facebook and Instagram which involves contests of sharing of videos, original photos, recordings, recipes, poems and more. The audience enjoys these contests and is engaging. Reviews: Giants like Amazon, Walmart who have pioneered the concept of ratings, reviews, testimonials for online selling and beyond. People like to play games, compete and win. Lift your audience’s competitive spirit by including compelling prizes in your promotion. Small rewards or big prizes attract the audience to get involved. To win $2500 scholarship, parents were asked by iHelp to enter the contest with a photo and a wish for their college-bound child. iHelp asked the participants to promote the campaign on Facebook, Pinterest, Twitter, Google+, LinkedIn with a hashtag #WhatIwish and provided a copy and paste URL to post on any webpage. Win a $2500 scholarship for your college-bound student. To enter just share your #WhatIWish and a photo. Easy peasy. Enter here: ow.ly/gVDM30hHu53 Contest ends March 31, 2018, so hop to it! Experiment with different kinds of offers to know which is a hit with your customers. Make Discounts substantial: There are no minimal discounts but substantial discounts perform better than general. Offers with free items or at least 20% discount typically reach more people. Use an engaging image: Photos of people using the product performs better than the photo of the product itself, and both perform better than logos. Set an expiration date: The ideal length for the offer is 7 days. Let people see the offer for a few days and save it and give time to share it with Facebook friends. 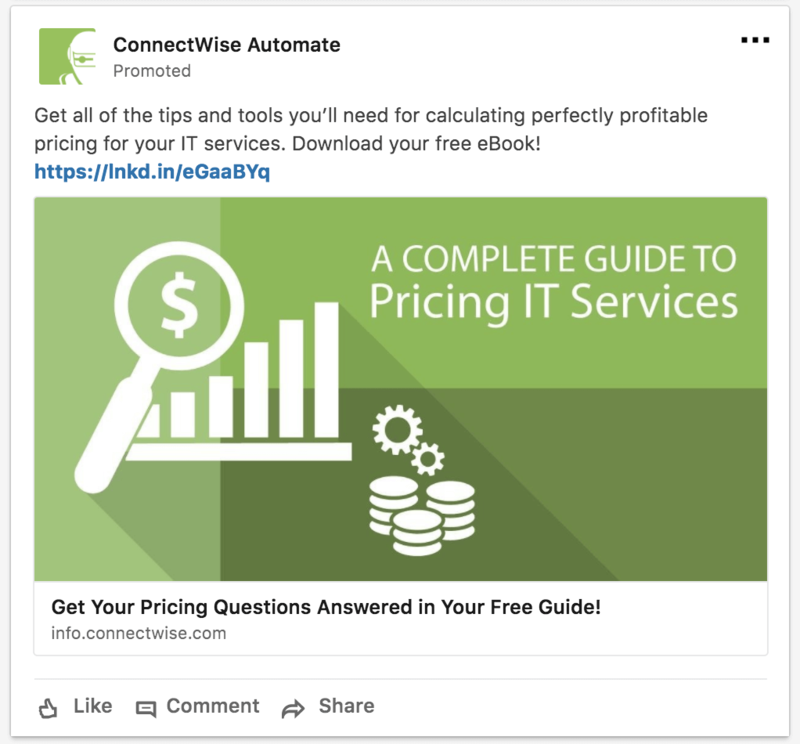 Pin it to the top: Pin your ad on the top on your Facebook page.to get it noticed. Engagement and utility go hand-in-hand. The top two reasons to use interactive content are educating the audience and engagement. Useful content is created to engage the customers which include tools like blog posts, video, images, infographics, guides, emails, webinars, podcasts and more. 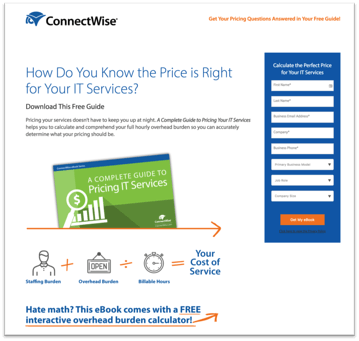 Below is a LinkedIn ad from Connectwise Automate that offers guidance to IT services vendors for pricing. The ad leads to a highly engaging and well-designed landing page with a beautiful form and a free calculator. How To Measure Social Media Engagement? If you want to know the effectiveness of your marketing campaigns, you can use social media analytics. It varies from platform to platform, however below are some metrics for most popular social media platforms. Facebook Analytics is a comprehensive dashboard to learn and track audience engagement for Facebook. Page Insights: Summary of daily, weekly and last 28 days Page performance. Promotions: Helps to identify the performing posts and worth boosting with an ad. Page Views: Traffic on your page and popular areas on your page. Posts: Shows how the individual post is performing. People: Demographic information about your followers. Twitter also has a robust set of tools to measure performance and engagement. Monthly Summary: Month-to-month performance summary. Impressions: The total number of your tweets seen. Engagements: The amount of time user interacted on your tweet including likes, comments, and retweets. If you have a business profile on Instagram, you can access Instagram Insights. Impressions: Total amount of seen to your posts. Reach: Total views for your posts. Website clicks: The number of clicks the link provided received. Profile visits: The number of visits to your profile. Post engagement: The number of likes and comments on the image. Actions: In the action page, you will see which posts inspired people to visit your profile, click on your site and follow you. Discover: A very vital information on discover page which shows the percentage of accounts who saw your posts but didn’t follow. Need help in creating social media graphics? Visual Deck offers unlimited visual content at a flat monthly rate. Try us out with a 14-day risk-free trial!